Not long after paying a visit to the hot pots at Element, I went to essentially the opposite sort of hot pot at Lu Gi. Now when I say opposite, I don’t mean in terms of the food itself, but the general setting. Here, the stoves weren’t built into the tables, but were portable and brought out to each table after ordering. 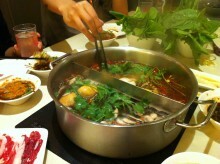 It felt like eating hot pot in someone’s home, except for the whole paying of money and whatnot. 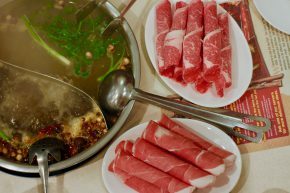 It’s really hard to get enough of hot pot, especially when you live in a place with a ton of hot pot options. 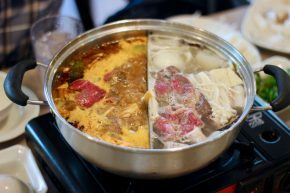 Element is a shiny and semi-new spot in Alhambra that offers all-you-can-eat and the divided hot pot that almost always seems necessary when I am eating with people who can’t handle heat. Just like back home in Chengdu. Slowly, but surely I am beginning to recognize the ethnic offerings Pittsburgh has for me. It shouldn’t be a surprise considering the universities here and the international students they attract. One of those internationals led me to Hunan Bar, a hot pot restaurant that I couldn’t wait to get to. Let’s get a nice boil going in here. 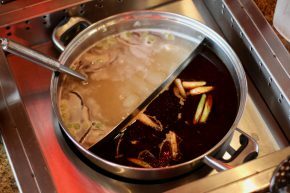 Compared to the Chengdu-style hot pot, Mongolian hot pot looks like it came from another planet. Or at least a much older planet. Differing from most other hot pots, this one still uses hot coals rather than an electric stove. It also looks nothing like a pot and looks more some obscure ancient brass ware you might find at an antique store. The broth, which is essentially water flavored by ginger and scallions, fills a moat that surrounds the central silo. 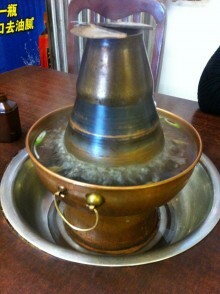 This silo contains the coals that boil the hot pot. After spending some time in China, you will find that the Chinese people are very prideful, and not simply prideful about their country, but about their regions as well. It seems like if you go anywhere in China, you will hear that whatever region you’re in has the best tea, best dumplings, best noodles and really anything else you can think of (best dog?!). The same goes for hot pot. So if you may think hot pot is simply a bot of boiling water to cook food in, you are wrong.